System Shock is an influential shooter, in part because it further develops the open world setup that we will in the future encounter in the Ultima Underworld series, but also because it leads into the environmental story telling exemplified by spiritual successor Bioshock. Many other games draw from it and the Thief series by some of the same developers again create this sense of place. The first isn’t on the list, but the second game is the one often cited as really standing out. I am genuinely excited about starting to play this. Despite the hours I feel I have already spent playing this, I want to go back and play more and more of this. This game has such a sense of setting that just walking around was interesting. Add to that a multitude of paths around the ship the main game takes place on, stealth or combat, and you get a complex enough game that encourages exploration. While the ship is divided in levels, they connect in different places, making it a technical restriction and slight progress blocker but still doing its best to create a more connected world. 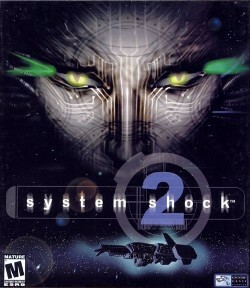 Although listed as an FPS, System Shock 2 has RPG elements in a way Deus Ex has. You get some choice in what aspects of your character you develop, buying upgrades from a few different consoles. It makes for a decent system that isn’t too complex or in depth, but causes enough blockers along your path to make you want to research and go back. The experience is in the small parts too. Playing on easy, dying respawns you as long as you’ve activated a machine for it on the level. It can be a race to reach it, but once you do, it creates a great base for for exploration. It allows the game to be tough and challenging, while staying in character. You’re not just reloading a save game, making it feel like you’re always making progress. It also leaves you with a difficulty that seems higher than the game could otherwise afford to be. I need to get back to this ship and see more of it, see where SHODAN leads me. The perfect way to do a shooter, tell a story and get me engaged.